Let’s speak frankly, writing numerous essays, academic reviews or term papers and completing loads of assignments are not the most engaging tasks in the world. Combined with the stresses of the everyday life of any student as well as deadlines approaching thick and fast, they become daunting and even overwhelming. Wishing to alleviate this pressure, some students may turn to custom PapersWriter. PapersWrite is one of essay writing services that promise to give your studies fresh start and do the messy job for you. I decided to test how it delivers its promises. So, keep on reading to find out if Papers Write is the right option for you. The good news is that PapersWrite is rather cheap and more affordable than many of the competition in the essay writing industry. The bad one is that it seems there are no promo codes, coupons or free features provided; you can claim some discount though. Let’s take a deeper look at the company’s pricing policy. The company charges $9.97 per page of 275 words. Nevertheless, it doesn’t mean that you can get any paper at this price. 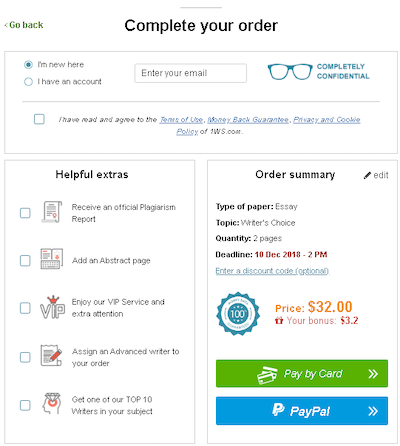 When it comes to a pricing system, PapersWrite has a notable gradation depending on the delivery date (from 3 hours to 14 days) and academic level you are prompted to choose. Therefore, a 1-page essay will cost you around $10 only if you are okay with undergraduate level and place an order 14 days before the deadline. However, in case you need your paper to be written urgently (that is in just 3 hours), please, prepare $41 per page for the same quality. Are there any discounts? At first glance, a discount program for the new customers turns out to be quite tricky: the company provides customers with 5% or 10% off only if the order costs more than $500 and $1000 accordingly. On the other hand, Papers Write.org offers great terms for loyal customers. From each order, you will get a 10% bonus to your Personal Balance Store that can be spent on your next purchases. Everything works according to the principle ‘the more papers you buy, the more bonuses you`re given’. As a result, over time you might not need to pay for yet another order and get a paper written absolutely for free thanks to bonuses. What About PapersWrite’s Writing Quality and Services? Nothing speaks better of the service than the order delivered to you. That is why we decided to pay for a small essay from the service to check if the pricing truly fits the quality of content. PapersWrite is a very simple website that allows you to find the information about service features at the top of the main page without much trouble. These are the main types of services the company offers to do without any plagiarism: custom essays, courseworks or term papers for students, resume writing or cover letter editing for those who are in search of a decent job or mind maps, SWOT-analyses or ‘how to use’ instructions for office workers. Usually, essay writing services place free samples of the works for you to check if their writers suit your requirement. Unfortunately, PapersWrite doesn’t provide this option; however, it does show the team who writes the papers. After paying $69 for three-page Bachelor essay on medieval art with a 5-day deadline, I expected it to be if not perfect then at least of the above-average quality. Unfortunately, the delivered paper turned out to be quite a disappointment. The essay I got here wasn’t properly formatted and had a huge amount of spelling mistakes as well as structure flaws. Furthermore, when reading it, I was worried to see a lot of issues with the subject knowledge by the writer. The piece contained a number of factual errors, something that shouldn’t have happened if the writer had been good at this stuff. Luckily, my essay was delivered one day before the agreed date, so if I were a student, I would still have time to make corrections. Another pleasant thing is that my paper was 100% unique, so the company does deliver its zero-plagiarism guarantee. Usually, when it comes to assessing customer support, there’s not much to comment on. The company doesn’t claim to provide support round-the-clock, and there are only two methods to contact them available: phone number (US and UK) and e-mail. As for me, livechat is the most convenient option, but since it is not provided, I decided to call them and try my luck. It took me four dials to reach customer support, and when I finally did, a cheerful female voice thanked me for calling and answered my questions regarding the money-back guarantee. The entire conversation didn’t last longer than three minutes, and I haven’t noticed any shortcomings in PapersWrite’s customer service. However, the fact that I spent more time reaching a support agent than speaking to him gives a lot to think about. Is PapersWrite.org a Scam or Legit? What Are Their Guarantees? The testimonials section on PapersWrite’s homepage is rather bleak and, obviously, doesn’t contain any real information or dated reviews. When searching online, I haven’t found any comprehensive reviews on trusted websites which almost surely means that the company is new on the market. So, if you are wondering ‘Is this service trustworthy and safe?’ you are not alone. Although there are lots of fraudulent companies, hitting students up for money, after placing an order at PapersWrite, I may conclude that this service definitely is not one of them. Moreover, there is a straightforward refund policy with money back guarantee. Depending on circumstances, you are eligible for 50%, 70% or 100% refund. They also promise that every single order will be delivered on time with 0% plagiarism and that they never resell, publish your work or reveal your personal information which is great to know beforehand. To summarize, PapersWrite isn’t the worst essay writing service in the world with quite affordable prices (less than $10 per page). However, there is definitely some room for improvement. Moreover, the lack of reviews on reputable websites, like SiteJabber or TrustPilot doesn’t contribute to the overall rating. If PapersWrite adds more contact options, more features and, what is more important, delivers higher quality, this would be a pretty decent and recommendable service. But at the moment I cannot rate it higher than 3,9.